Well, I had my first acupuncture appointment yesterday. It was sort of what I expected… but with a nice surprise. In the waiting room, pictures of babies. Lots of them, in a book. A brag book of sorts, with letters from patients who were LIKE ME. Infertility flunkies. Used to disappointment, but very adamant that acupuncture was the key to their long-awaited pregnancies. JD, acupuncturist extraordinaire, was very knowledgeable about his craft. He walked through my health history in more detail than an doctor ever did. Asked me about my “feelings” through my infertility journey. And gave me a starting tutorial on the yin/yang (pronounced “yong”.. who knew)? 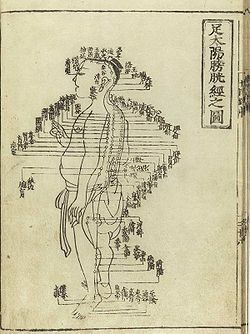 and the history of Chinese Medicine. I found out my movement of Qi (pronounced “chee”) is less than optimal when it comes to my spleen (official Chinese diagnosis: deficiency of spleen Qi). Not to mention the probable affect of my heart/blood disharmony. I have to admit, by the time I laid down on the very comfy table listening to the sound of the many “water features” (fountains) in the room, and the soothing music I was wondering what I had gotten myself into. BUT, there was “something” my body reacted to when he began placing the needles. About 10 minutes in, I felt my body start to melt into the table. I would qualify the sensation as very, very, VERY relaxing. Perhaps with my hectic life, I took advantage of lying on a table in such a serene environment and, just simply, “detached” and became relaxed. But after I rose from that table and walked out, I felt like I was walking on air. Time will tell. I have another appointment next Tuesday, and it appears I’ve finally found the magic bullet to at least zap that anxiety and tension out of my body, momentarily at least. Whether it helps me in my DE cycle, who knows… but for now, I am feeling like this is a very good diversion. OMG! I know exactly how you felt! I love acu and recently started it again in preparation of IVF #2 :)I swear I get the best sleep on that table! That’s great that your body was so relaxed! I hope your next appointment is just as relaxing for you. Yay! I’m glad you enjoyed it.It didn’t get me pregnant, but I definitely LOVED how relaxed I felt durning and after a session. Acupuncture works so well for so many different things. I’ve been going for almost a year, for flat-out crash-n-burn burnout. It’s done wonders. That melting feeling…I love that feeling. It’s more than just being left alone and allowed to rest, there’s something else going on. I so hope it works for you! I told you already, but I’ll say it again. I swear by acupuncture and I really believe that it has played a huge part in my pregnancies and if I would have continued to go the last time instead of stopping, maybe I wouldn’t have m/c. Who knows, but you bet your bottoms that I am not quitting this time! I’m glad you enjoyed it. Your experience sounds alot like mine. I was never fully convinced that it was doing anything to help with the success of my IVFs (in fact, I didn’t do it for the FET that finally worked), but I loved it anyway. It was worth every penny for the way it relaxed me! At one point during our “journey” when I had stopped going, in part because of the cost, my husband encouraged me to go back because it really help me deal with stress so much. I almost always fell asleep during my treatments! I always feel really good after my treatments as well. Did you get the heat lamps? I love those. I found it interesting that my acu also asked often about my feelings. She had a lot of emphasis on going with the positive ‘flow.’ Call it mumbo jumbo, but I think it has an effect. I always think of these ‘alternative’ treatments as a gentler science. Modern medicine is brutal, albeit effective. Sometimes I think there must be a happy medium somewhere. But really, I just want a baby (or two) and I don’t care how I get ’em! yay!! that is totally the acupuc feeling, like you are floating after the appointment! love it!! so glad it is helping you relax! I had one acupuncture session in an attempt to turn J from breech to vertex. I’m usually VERY anxious when driving, especially when I’m not familiar with where I’m driving. After I left my appointment, I got truly and utterly lost. I called my husband on the phone to ask for directions home. I have NEVER been so calm in all my life. It was awesome! The relaxed feeling lasted the rest of the day. I hope it helps you! I know everyone’s situation is different, but wanted to let you know that my mom used accupuncture to get preggo with me oh so many years ago!I hope it works for you too!